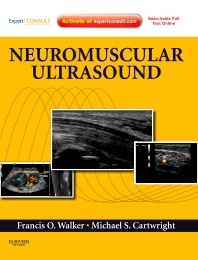 Neuromuscular Ultrasound demonstrates the use of ultrasound as an alternative to electrodiagnosis in the evaluation of neuromuscular disorders through detailed descriptions and clear illustrations. Drs. Francis Walker and Michael S. Cartwright discuss techniques for visualizing muscles and nerves without painful testing for better patient compliance and more efficient diagnosis. Color illustrations, pearls for the clinician, and ultrasound videos online at www.expertconsult.com, ensure that you’ll be able to apply this technology effectively in your practice. Access the fully searchable text online at www.expertconsult.com, along with ultrasound videos that demonstrate ultrasound evaluation in real time. Diagnose and manage your patients more quickly and easily by visualizing muscles and nerves without painful testing. Master the nuances of using ultrasound through the visual instruction of clear images and illustrations. Minimize patient discomfort while maximizing optimal patient evaluation with a practical focus that covers using ultrasound as a screening tool, provides clinical pearls, and includes comparisons to electrodiagnosis. Apply the full range of ultrasound applications, including interventional uses (such as ultrasound-guided botulinum toxin and steroid injections), ultrasound of polyneuropathies (often found in diabetics), and more.